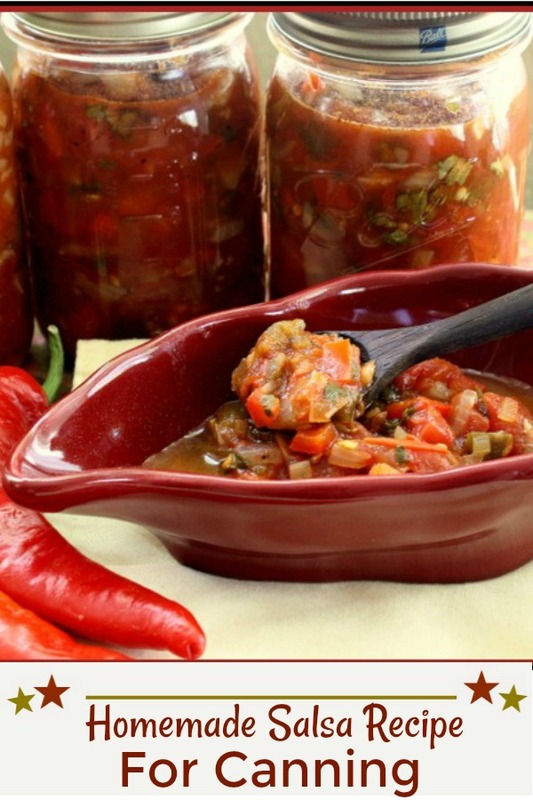 A Fresh Homemade Salsa Recipe for Canning. A batch of this will keep you warm all Winter long. 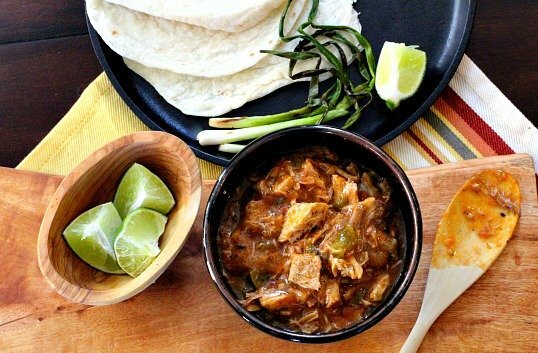 Full of flavor, your tortilla chips will thank you. 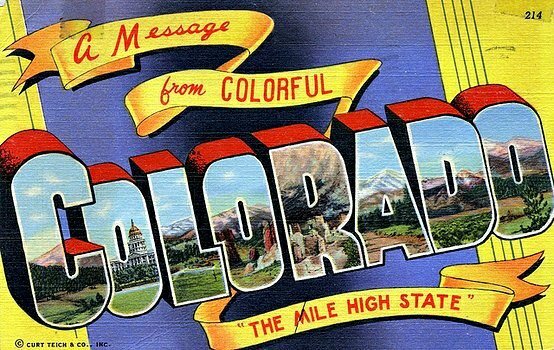 Last November, our company opened up a new branch location in Castle Pines, which is just south of Denver. To celebrate the expansion we threw a little mid-day open house party complete with an impressive array of food and beverage. On the buffet, I noticed an inviting bowl of salsa sitting sitting next to a big bowl of tortilla chips. Bright, fresh, colorful and chunky I raced for a chip to scoop up a bite. Just as I thought…fabulous. I sought out host, Sandra, to ask her the brand and where to purchase it. To my delight she replied that it was her own recipe and she had made it herself. And best of all, she shared the recipe with me. It’s been almost a year since I got the recipe. I didn’t want to attempt to make it until our seasonal fresh vegetables were in all their glory. I canned eight quarts three weeks ago, and another eight quarts this past weekend. I’m thrilled to have this recipe because I’ve never had a good homemade Mexican salsa recipe for canning. It’s a great combination of flavors which I attribute to the fresh and local vegetables, a good quality chile powder, seasoned rice vinegar and my mistaken addition of smoked paprika… and too much of it. We actually ended up liking the smoky flavor. Smoked paprika is a necessity for any pantry. So many ways to use it to bring a beautiful flavor to your favorite dishes. One of my favorite ways to use it, is to liven up my Homemade Taco Seasoning. I’ve included an affiliate link if you’d like to browse brands. Best part about this recipe, is that I have a supply of great tasting fresh salsa that we’ll be enjoying all Winter. We’ve already opened one jar and you’d think it had just been freshly made minutes ago. This recipe is for one batch. I quadrupled it to make eight quarts. You should give this canned salsa recipe a try. You’ll be glad you did when the snow is flying. I hope you give this homemade salsa recipe a try and if you do, please come back and give it a star rating. Your input is valuable for me to develop future recipes. 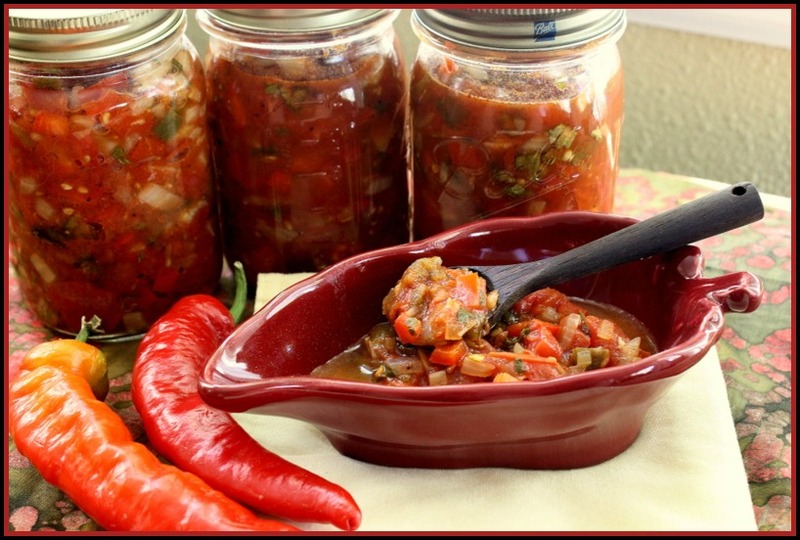 And if you have a favorite homemade salsa recipe for canning, let me know, I’d love to give it a try. Rough chop all vegetables and using pulse button grind each in a food processor as you go. I like my salsa chunky so just a few whirls did the job. Place all vegetables in a large bowl and add seasonings, tossing well to blend. Place salsa in canning jars and water bath for 15 minutes. Couldn’t agree more Heather .. and one of the more healthier. That sounds very good. I wil be waiting by the mailbox for my jar. There is nothing that beats a fresh salsa-no comparison to store bought. Divine! Simply divine. I couldn’t agree more Velva. Where have you been all my life. I love the fresh salsa that Bev makes but just care for the cooked stuff – Pace or otherwise. It looks like the quick processing keeps this more toward the fresh end – and the recipe sounds good as well. I’m thinking you’re right Larry… I asked Sandra twice to make sure I heard right that she didn’t cook it. Only heat is the15 minutes of boiling in the water bath. I”m liking that a lot. Looks great! Love the bowl! Sounds fabulous Lea Ann. I love smoked paprika and I’m sure it made a great addition. As I read this I thought of Larry and his homemade tomato juice. What do you bet he’ll be making your salsa next year with his bounty of tomatoes. And you know I’d like to make his homemade tomato juice. Maybe I can trade him a jar or two. hmmm. nice recipe. might give you mine. might not. I love having my own homemade salsa in the pantry! It beats store bought all the time! And you did it all alone? You are amazing! Years ago an aunt and I used to make our own chili sauce…we made pots and pots of it, but did it together. It was such fun and that chili sauce was sooooo good. This salsa recipe is pure gold, Lea Ann. I sure wish I was a neighbor! For the first batch, I hand chopped all the vegetables, man was that time consuming. The 2nd batch was much easier to manage solo as I used the food processor. Things went so much smoother. I’m not familiar with chili sauce and don’t think I know exactly what it is. I wish someone would would blog about it. This sounds and looks amazing. I was hoping to get enough tomatoes off of my plants this year to make salsa but it was not meant to be. If I can find some good looking tomatoes I’m going to make some of this. We love salsa around here. This looks and sounds “to-die-for” good! I was curious if you used dried oregano or fresh. Usually the ratio is 1 t dried equals 3 t fresh, but fresh is pretty strong for me. Sadly, I just put up all my hot peppers yesterday so there won’t be any salsa for me. But I am printing and stashing this recipe for next fall when I’m up to my eye teeth in peppers and tomatoes again. Love the change to smoked paprika – it’s one of my favorite little game changers in chili and Mexican rice. Really beautiful photo (you know I watch those) and did I hear there’s a new bowl coming?? I don’t have much of a sweet tooth and will take salsa and chips over a plate of cookies any day of the week. Making your own means you have just the right level of heat. Yummy. I hope I can still find some fresh tomatoes at the farmers’ market because I really want to try this! I love that it’s not cooked except for the hot water bath. I really think that’s the trick to keeping it colorful and fresh tasting. Thanks Susan. just made the best batch of salsa that i’ve ever come across. standard non-recipe: roasted a bunch of whatever looked fresh at the farmer’s market. but the one thing that stands out was that i only used green tomatoes, and an equal proportion of tomatoes to tomatillas. tangy without bitterness, and roasting brought a little sweetness to the mix. did a quick google and there aren’t many green tomato salsas out there, but i recommend giving it a shot. That’s fabulous to know Steve, I have a bunch of green tomatoes that I hauled inside in a panic with pending freeze predictions. I’ll be doing the same, and thanks for the roasting tip. Those jars of salsa look so great. We have a local guy that sells his in small batches and it’s as good as what I can make so I’ll buy his often. Ya know Chris, I usually can answer that to the penny … but didn’t pay attention this year. This looks good – and so colorful. I found a recipe for zucchini salsa and canned 8 pints yesterday. You’d never know there was zucchini in it. I’ll do a blog post soon. I’ll look forward to that salsa recipe Karen. I’ve been wanting to try canning, and this seems like a good way to try it. I love salsa and could put it on almost anything. In fact, one of my favorite busy night recipes is to put two chicken breasts and 16 ounces of salsa (usually one whole jar) in a baking dish and bake at 350 for 30 minutes. So easy and delicious. Thanks for sharing. How much easier could be get than baking salsa over chicken. Sounds yummy, then some grated cheddar? I’m all over that. Hi there..I came across your recipe via pinterest..love the idea of it being “fresh” and not cooked as I’m a salsa fresca kind of gal. Do you have any idea the shelf life of your salsa? Hi, I noticed my comment was not posted and hence no response. Would you be so kind as to answer my question privately? I’m an American living in The Netherlands who really misses good salsa! I would love to make this salsa to store away for the winter but am wondering the shelf life. Just back from traveling for the holiday. I’ve sent you an email. Thanks for stopping by and enjoy the salsa. Is this recipe really for 6 tomatoes? Because it seems there are as many jalapenos or hot peppers as there are tomatoes? I sent you an email. Thanks for the question. This sounds delicious! I would like to know what the shelf life is, as well. I’d say for at least a year, assuming that the canning process was successful. Thanks for stopping by and the question. 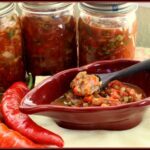 I have been searching, searching, searching for a recipe for salsa that can be canned and still tastes fresh from the garden, and I’m so glad I came across this recipe! I have to admit, I’m a bit nervous about it keeping all winter, especially since I’m getting ready to make about 8-10 times the amount. I know you’ve addressed shelf life in your comments but any reassurance would be so appreciated. Thanks so much for the recipe! I gave it a trial run yesterday, and it was delicious! Just added a couple tsps. of cumin since we’re a cumin-loving family.